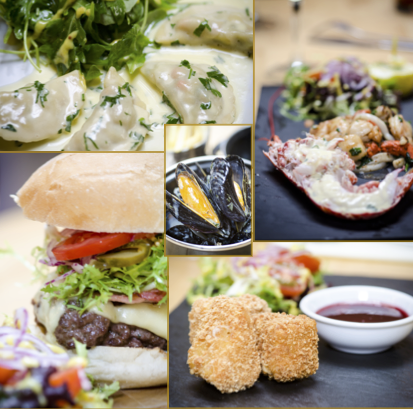 At the Golden Cross Inn we're proud to offer some of the finest pub dining in Cirencester and its environs, prepared by our dedicated chefs and professional kitchen crew. Guests staying at the pub tell us our breakfasts are second to none and are sure to set you up for the day, while the pub's lunch and evening menus feature classic pub fare such as homemade soups and pate, homemade gourmet burgers, fish 'n' chips, etc., with a strong focus on locally-sourced artisan products, from our bread and butter to local game, sausages, pies and more. The pub also offers a comprehensive range of sandwiches at lunchtime, together with a children's menu. In the evenings diners can experience a more Brasserie-style menu embracing British and European classics with a contemporary twist, with many seasonal dishes on the board, all prepared to order from the freshest locally-sourced ingredients, cooked to perfection and served with love in an informal dining environment. House specialities include sautéed scallops, grilled lobster with garlic and chive butter, skipper's catch of the day, or take on a beef bourguignon, Billingsgate fisherman's pie with scallops, smoked haddock, king prawns, monkfish and gruyere mash, locally-reared 28-day hung steaks, and our signature 16oz chateaubriand with all the trimmings. Vegetarians are well catered for with a variety of options both on the menus and on our specials board, which features an ever-changing range of seasonal creations. On Saturdays and Sundays the pub hosts an informal breakfast service from 9am until noon, followed by our family-friendly brunch service until 4pm, and our Sunday Roast is famous throughout the county and beyond as some of the finest family dining in the Cotswolds. Larger parties can be catered for in our Stable Bar function room to the rear of the property, and in the summer the garden beckons as an ideal venue for an al fresco lunch, barbecue or early supper. Can't find your favourite dish? Let us know what you'd like and we'll try to accommodate you! Copyright © 2019 The Golden Cross Inn. All rights reserved.